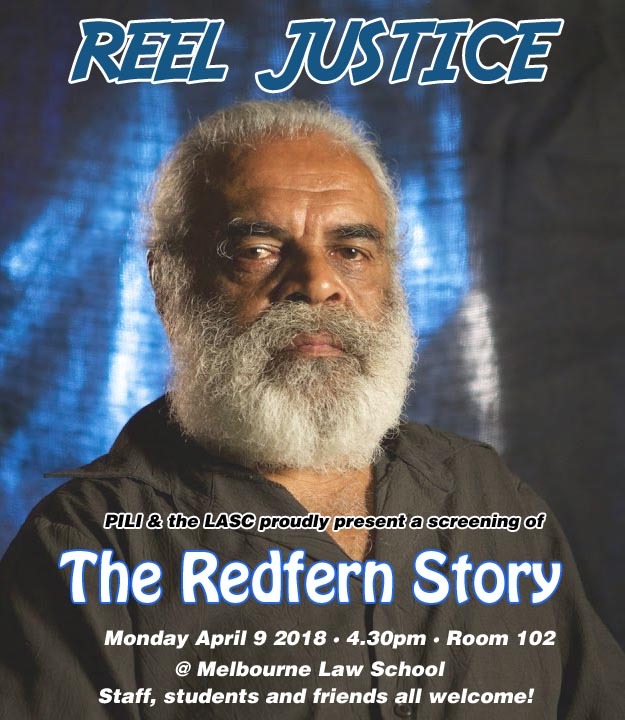 The next film in Melbourne Law School’s Reel Justice film series will be The Redfern Story on Monday April 9th at 4.30PM. Join us in Room 102 for this award-winning documentary before attending the Uluru Statement from the Heart Panel at 6.30! ‘A tribute to the deadly trailblazers who fought for land rights and social justice and who made a lasting impact on national politics, social welfare and the Australian arts scene. In the late 1960s and early 1970s, the Sydney suburb of Redfern became home to over 20,000 Aboriginal people. With the gradual revoking of the reserve system in New South Wales, Aboriginal people drifted to the city looking for friends, family and work. Redfern, then a run down slum where only the poorest people lived, was the cheapest and therefore most affordable place for these displaced country people to find refuge. It was soon overcrowded: poverty, illiteracy and alcohol provoked anti social behaviour and conflict arose between the new inhabitants and the police. In 1967 the overwhelming “yes” vote in the Referendum gave Aboriginal people hope that their plight would be recognised and help provided. A few brave pioneers, like Faith Bandler and Kath Walker (Oodgeroo Noonucle) worked hard to raise awareness of the cause. However, in reality little changed. Then, in 1971, something happened which marked the beginning of the fight for equal rights and equal opportunities for Australia’s first people. A small group of untrained, but passionate and talented activists came together and formed The National Black Theatre which became a focal point for activism until it closed in 1977.